Happy Solstice, All! Tonight is the longest night of the year here in the northern hemisphere, and the last of the golden sunlight left the tops of the redwoods before 5 pm. It’s cold, dark, and damp in the woods, urging us to spend more time indoors, preferably in front of a fireplace, keeping warmth and light within ourselves as winter begins. Our very distant relatives the fungi, however, thrive outdoors in this season, popping up in locations undisclosed by experienced mushroom hunters. The beautiful bright yellow chanterelle is the king of the mushroom clan here in central California. Their golden hue makes them a beautiful addition to the solstice table, and their chewy, meaty texture makes them a substantial side dish. I didn’t know much about chanterelles, but was lucky enough to chat with a produce clerk at our local natural foods store while she unpacked a new delivery this week, as she lovingly placed each large mushroom in an arrangement that allowed air circulation. When I asked her how to prepare them, she suggested sautéing in butter. Just then the daughter of a French chef joined our conversation. She agreed that a sauté was the way to go, and offered an ingenious cleaning method. Chanterelles are known to be dirty and difficult to clean, to the point that some cooks suggest just eating the dirt. However, the French chef uses soft toothbrush and a little running water to dislodge dirt and organic matter without bruising the mushroom. I discovered that on the underside dirt is most easily removed by stroking the toothbrush from stem to cap edge, because the gills get wider in this direction. When finished brushing and rinsing, cut off any areas of stubborn dirt (like the bottom of the stem) with a small paring knife. 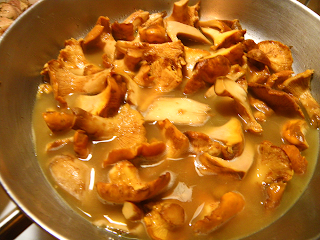 Chanterelles are also known to release a lot of liquid when cooking. Some people drain this off, but both the French chef and the produce clerk cook the chanterelles till the liquid evaporates to preserve the earthy flavors in the liquid. Since I used the super-fresh mushrooms, a huge amount of liquid was released, and I thought the chanterelles might overcook if I continued to cook till the liquid evaporated. So, after about 10 minutes of sautéing, I removed the mushrooms and cooked down the juices till they thickened, then put the mushrooms back in for a few minutes. Results were delicious. One final word: don’t slice the chanterelles too small. They shrink considerably while cooking, and a large part of what makes this mushroom unique is its toothsome meatiness. 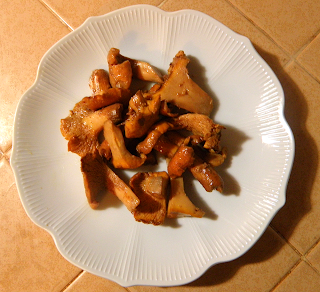 Part of the chanterelle experience, according to experienced chefs, is the texture of a large chewy bite. 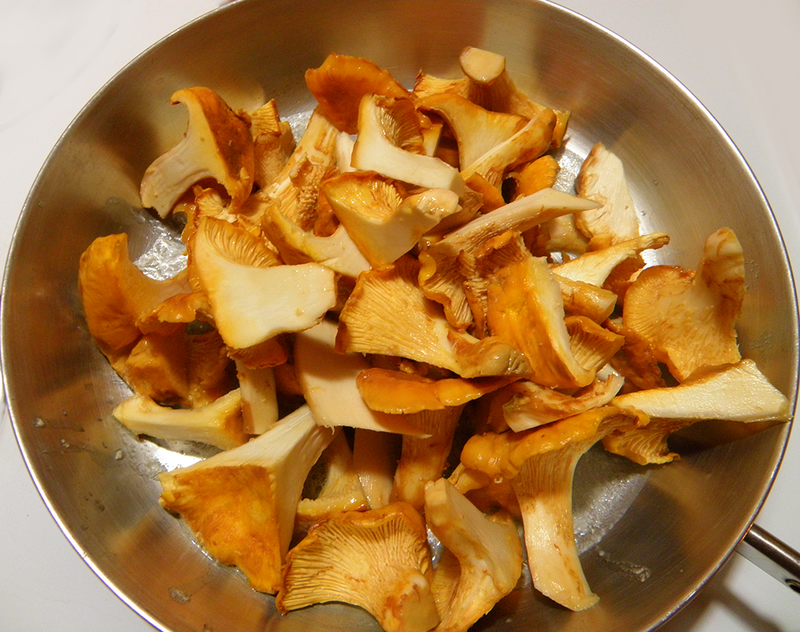 Wash each chanterelle carefully, gently using a toothbrush and water to remove as much dirt as possible. Cut off any remaining dirt with a paring knife. Drain and/or blot dry with kitchen towel. Small chanterelles can be left whole. 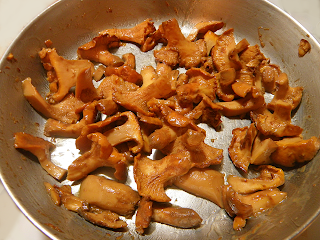 Cut large chanterelles into halves, thirds, or quarters, keeping pieces large. 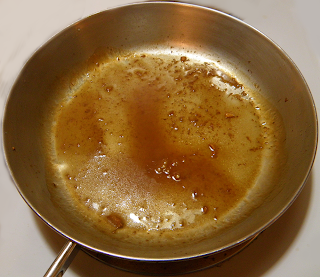 Melt butter in sauté pan over medium heat. Add chanterelles, and sauté, stirring frequently. At first they will release a lot of liquid. Continue to cook and stir until they stop releasing liquid, about 10 minutes. If it looks like there is more liquid in the pan than will evaporate in about 5 more minutes, remove chanterelles from pan and cook liquid down, turning heat to medium high and stirring constantly until reduced and thickened. Return chanterelles to pan and lower heat to medium. Sauté another 5 - 8 minutes, stirring, till liquid is nearly completely evaporated and chanterelles develop a chewy texture. A little salt intensifies their flavor. Let diners add their own at the table.